McEuen has made over 40 albums (7 solo) that have earned four platinum and five gold recognition awards, Grammy nominations, CMA and ACM awards, an Emmy nomination, IBMA record of the year award, and performed on another 25 albums as guest artist. He's also produced another 7 albums, and 14 film scores (two Emmy nominated shows) and more than 300 concerts throughout his career - the first in 1965 in Long Beach Calif., with Bob Dylan. His production of Steve Martin - The Crow won the 2010 Best Bluegrass Album Grammy. Prior to that, The Music of the Wild West CD- produced by McEuen, was honored with the Western Heritage Award. A Grammy nomination for String Wizards II preceded the1994 Uncle Dave Macon Award for his excellence in preservation and performance of historic music. On Sirius/XM's The Bridge, John's popular Acoustic Traveller show is now in its 9th year. McEuen produced and directed the 2006 documentary film The Dillards - A Night In the Ozarks, which captures his early mentors at their best. In April of 2018 John officially became an author, with his first book The Life I’ve Picked being published (On Chicago Review Press). A memoire, a telling of incredible stories from raising 6 kids in the music business and the ins and outs of being an iconic band member to being a single father to his current full and varied career, his book takes the reader on his unusual journey. In September of 2017 John was inducted in to the American Banjo Museum Hall of Fame. Three years before he became a founding member of the Nitty Gritty Dirt Band, teenage Disneyland Magic Shop magician John McEuen discovered that he liked being in front of people. In his last months of high school 'music' showed up and put him on stages of all the many southern California folk clubs. Playing solo and with others (Michael Martin Murphey, Jose Feliciano, Penny Nichols and Mary McCaslin, and his first group, Wilmore City Moonshiners) would lead to Grammys and entertainment business recognition, fans around the world, and a career that has spanned 50+ years. Initially, searching for a path to showbiz in 1965, with borrowed money (from his father) McEuen booked Bob Dylan for a concert in a Long Beach high school auditorium. It sold out! He paid back the loan and bought a new banjo. By 1970, his brother (then manager/producer of NGDB) also began managing his high school buddy Steve Martin, with whom John had worked with in Disneyland's Magic Shop (“Steve says he learned a lot of banjo from me. I could just steal notes off records quicker was all; Steve has written some of my favorite banjo tunes. But I learned a LOT from him, and not all music”). 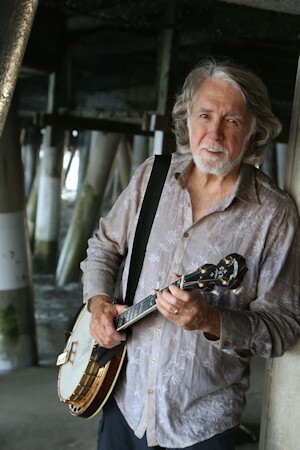 Multi-instrumentalist McEuen has ventured into varied musical genres, making 7 of his own CD's and producing 10 others. Taking his music and other talents to different formats including television specials (writing and producing), film scoring (14 FILMS TO DATE), unusual award winning CDs and concert production, John has received recognition and awards in MANY the fields. Keeping up an active concert schedule, he also won a Grammy for Best Bluegrass Album for his production of The Crow - New Songs for the 5-string Banjo by Steve Martin, on Rounder Records. September of 2017 he was inducted in to the American Banjo Museum Hall of Fame! His love of acoustic music history and being onstage is evident to all those who see him putting his banjo, guitar, mandolin, fiddle, lap steel, and piano together with songs and comedic storytelling. After doing over 10,000 interviews McEuen started his Radio show, Acoustic Traveller, on XM's The Village, now in its 9th year. The music John performs today evolved from early inspiration from seeing The Dillards in his native Southern California, and music he made going down that early road with various artists. In his career so far John has played over 9,500 shows around the world. His book - The Life I've Picked - was released in April of 2018 on Chicago Review Press. John McEuen has performed and/or recorded with: Dolly Parton, Willie Nelson, Bill Wyman, Johnny Cash, Marshall Tucker Band, Steve Martin, The Smothers Brothers, Rowan & Martin, Clint Eastwood, Phish, Crystal Gayle, Michael Martin Murphey, Hans Olson, Tammy Wynette, Bill Monroe, Earl Scruggs, Lester Flatt, Leon Russell, Kevin Nealon, Tom Chapin, Pete Seeger, Mary McCaslin, Vassar Clements, Jose Feliciano, Sissy Spacek, Tommy Lee Jones, Andy Williams, Dizzy Gillespie, The Band, The Doors, Foreigner, John Denver, Kenny Rogers, Little Richard, Mary Chapin Carpenter, Robin Williams, Albert Gore, Robert Schimmel, Tom Petty, Stephen Wright, Little River Band, Air Supply, Doobie Brothers, Bill Cosby, Martha Redbone, Hootie and the Blowfish, the list goes on, and there are stories about all of them.